Another installment of Michael5000's grouchy exegesis of that ubiquitous internet atlas of our times, Forty Maps that Will Help You Make Sense of the World. Note: In cutting and pasting the images (at low resolution and for purposes of critique in a non-commercial forum, yo!) I included "Twisted Sifter's" own attribution. They aren't live links here, so to see the original you would have to go to the original post and click through from there. 26. "The 7000 Rivers that Feed into the Mississippi River"
Technical Merit: People who have been taught that the the Mercator Projection is BAD for a world map can be a little bit like people who have been convinced that avoiding the passive voice is an essential key to good writing. Truth is, sometimes the passive voice is what's needed, and the ol' Mercator is not always a bad choice for mapping the Earth in an available rectangle. Where I like the Mercator least, however, is at the regional scale, where there really isn't any offsetting value to justify its distortions. It is ubiquitous in maps of the United States, however -- just check for the straight-line US/Canadian border, and a tweaked-out New England that looks like it's trying to make for Portugal. I don't usually think of red as a great color to represent water -- most maps of this sort would use a dark blue -- but it certainly has the benefit of high visibility. If you are a map dork, the first thing you think when you see this sort of map is "what's a river, and why are there 7000 of them?" Which is to say, what bodies of water did the cartographer include? Possibilities that spring to mind would be streams above a certain average flow volume, or streams named as rivers, or -- most likely -- all of the streams that happen to be included in a given data base. In this case, the specifics wouldn't really affect the overall pattern, but it's always nice to know. Artistic Merit: None attempted, I think. Certainly none gained. Helps One "Make Sense of the World": I can think of two things here. One is that, for a UnitedStatsian, the extent of the Mississippi watershed is not a bad piece of knowledge to have on board. The other is that it's kind of interesting how the watershed of a very large river can drain a very large interior, truncating the drainage areas of smaller coastal rivers. I don't know if either of these things qualifies for a must-read 40-item "Help You Make Sense of the World" list, though. Or wait, actually I do know. They don't. 27. 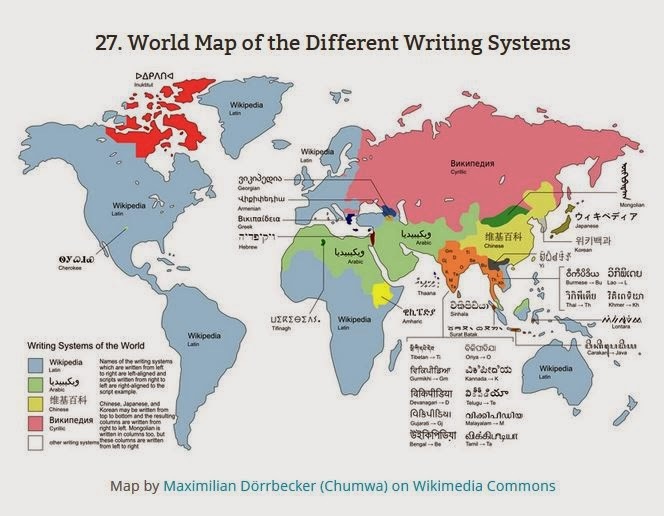 "World Map of the Different Writing Systems"
Technical Merit: The weak title is a hint that not a lot of expert knowledge about "the different writing systems" went into the production of this map. For all that, and for all that almost every single map element is deeply problematic, it is honestly a fairly decent first pass at mapping where different forms of text are in play. It's fine. There is no need for the legend, since all of the color symbols are directly labeled on the map. Isn't it interesting, though, to see which writing systems that the cartographer thinks are "other"? I don't know where the cartographer found his rinky-tink base map, though, with its three-island Japan, maimed New Guinea, amoeba Europe, impassable Tierra del Fuego, and emasculated Alaska. Artistic Merit: None attempted, none gained. Helps One "Make Sense of the World": A map or two of linguistic geography are valid on a list of forty maps that might help you make sense of the world. 28. 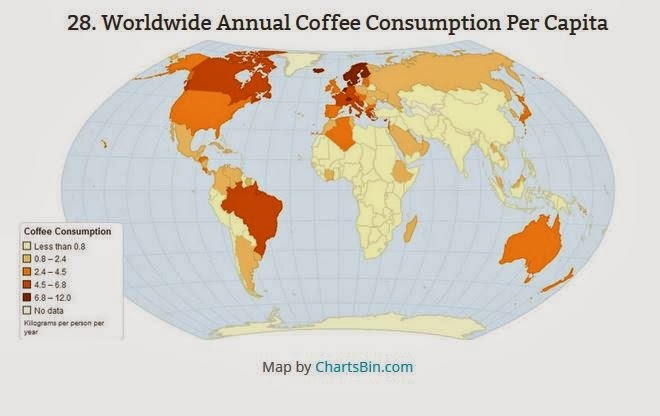 "Worldwide Annual Coffee Consumption Per Capita"
Technical Merit: Having the "No data" class so close to the "not much consumption" class made me think initially that this was one of those maps that show the world when only regional data is really available. But no, if you look at the original source map you can see that they've actually got real numbers for most countries, the central Asian 'Stans being the odd countries out. Hell, it's even sourced: Coffee consumption, World Resources Institute. The symbol scheme on this choropleth map is intuitive and logical. Increasingly darker browns look and feel like ~more coffee~. The global pattern of consumption, as told by the World Resources Institute, is easy to read and interpret. Helps One "Make Sense of the World": Coffee is not as amusing as alcohol, but it is still kind of amusing! Gotta wake up and get to work in the morning! We have a map of coffee on our list! 24. "The Economic Center of Gravity Since 1 AD"
Technical Merit: This map is brought to you by the concept "reification." Reification is when an abstraction is treated as if it was a real thing. It is generally considered a form of fallacy. Bless its soul, this map at least defines its terms, in that clumsy footnote that didn't need to be a footnote. What the economic center of gravity "is," is a location generated by doing some geometric multiplication with Gross Domestic Product, a famously problematic guesstimate of national economic activity. McKinsey Global Institute certainly has an impressive historical record of GDP data. It goes back 3000 years, to about 2950 years before the contemporary concept of nation-states on which GDP is based really went global. Also, they go 11 years into the future, which might seem impressive; but I'll warn you, it's my experience that predictions of what's going to happen more than a few months in the future are wrong. Always. Except for eclipses; we can nail those every time. The brown arrows are what makes this map impressive, racheting as they do towards the new economic might of China and India. Those arrows are brown instead of blue, which probably -- map legends always leave out the important stuff -- indicates "we don't really have the data for this yet." "By far the most rapid shift" -- We think, probably. We don't have the data yet. Pardon our brown arrow. 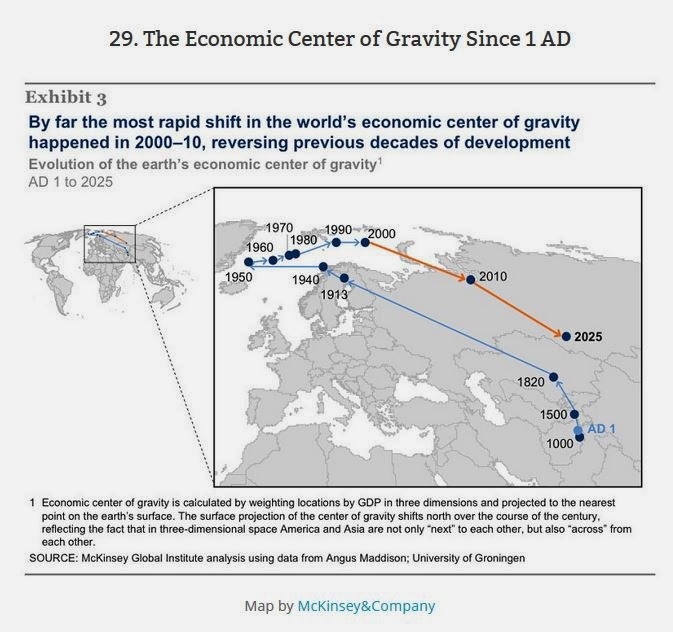 "in the world's economic center of gravity" -- which is to say, an imaginary point on the globe we generate by performing simplistic calculations on simplistic economic data. "happened in 2000-2010" -- our formula produced a new result, having been fed new data. "reversing previous decades of development" -- continuing the previous five decades of development at an accelerated rate, actually. We apparently can't read our own map. So yeah, I'm terribly impressed. Artistic Merit: This map consciously or unconsciously employs the strategy of projecting authority through a spartan, drab look. I'm not impressed by that, either. Helps One "Make Sense of the World": There's been economic growth in the Asian core of the world's population? Gosh, I hadn't heard that. Technical Merit: This is the third map we've encountered in the set that wants to make a point about the distribution of the world's population. As I pointed out before, that pattern is best shown by a world population density map. Anything else you do with the data is inherently obfuscatory. This map's conceptual flaw is that it ignores the vast disparity between population cores and the world's vast expanses of rural areas. To illustrate this, just contemplate that the line between European gold and Asian purple on this map could be extended to the Pacific and south across Central Asia without really disturbing the balance too much; maybe Iran would need to jump to the purple camp to compensate. A regional map with borders that fluid is pretty meaningless. This map's technical flaws are that, first, the Southeast Asian blue is not visually different enough from the Asian Purple, not the Asian red and orange from each other. Since the message of the map is, or ought to be, that everybody who's anybody lives in Asia, those colors ought to be very distinct indeed. Secondly, putting Australia and New Zealand on the green team, but on the opposite side of the map, is a fail. Since there is no visual cue that the green region circles around the back of the map, as it were, a newbie to world population could be forgiven for taking away the lesson that Australia is a densely peopled continent, when in fact it is only a densely kangarooed continent. Pay attention to the red bits. It turns out you can pack a hell of a lot of people into the Nile floodplain. You know, I don't want to be too demanding of a reader, but I can't help but feel that you're not being grouchy enough. I'm not used to being grouchier about maps than you are, and it's disorienting me. I am sorry that you feel let down. If there are particular maps that you would like me to knock around a little, just say the word. 26. 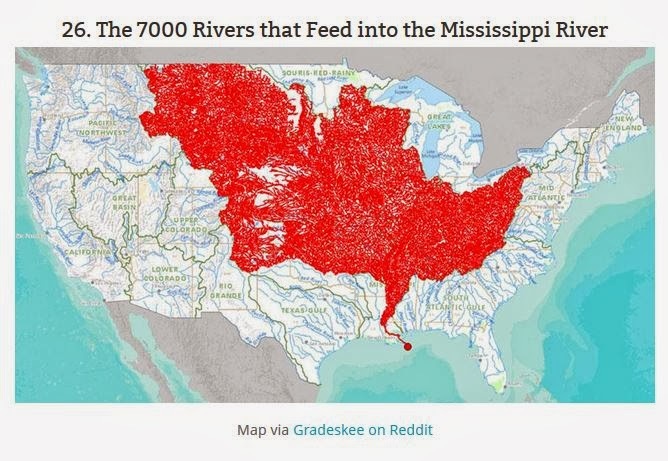 "The 7000 Rivers that Feed into the Mississippi River" is rather similar to 16. "Map of Rivers in the Contiguous United States". Do we really need both these maps in our limited set of 40 to help us make sense of the world. Why not ditch one? Better yet, both. First complaint: the Mississippi's drainage extends into Canada, but not on this map. Apparently international customs is cracking down on streams without passports. Bonus: just discovered that this map was made with a nifty online tool: http://nationalatlas.gov/streamer/Streamer/streamer.html , which is fun and much more informative than the static map, except the continued US-only problem. I wanted to see the Columbia River's drainage. The tool defaults to "trace downstream". The source of the Columbia (and much of its drainage) is in Canada. Annoying to impose political limited on non-political things like drainage basins. Even worse, the tool isn't smart enough to realize some rivers in the US connect to the Columbia in Canada. So asking it to "trace upstream" from the mouth of the Columbia results in the Pend Oreille, Clark Fork, Blackfoot, and Kootenay Rivers, among others being omitted. In reverse, if you have it "trace downstream" from, oh, Lake Pend Oreille, you'll see it flows into a river that ends at the US-Canada border (in reality it just barely enters Canada before joining the Columbia). 27. "World Map of the Different Writing Systems". Ha, yes, the base map is sad. Poor Madagascar! And Lake Erie and Ontario, I hardly knew you! Hispanola, however, is battling Cuba for the title of largest Caribbean island. And yea, a map of writing systems could be good, but this particular one is pretty sad. As for the legend, am I missing something? Four colors are listed, for Latin, Arabic, Chinese, and Cyrillic, plus white for "other". I don't see any white areas on the map, but I do see orange in India/SE Asia, red in Nunavut, yellow in Ethiopia, dark green in Mongolia, etc. Confusing! I suppose the legend only shows us the "big four", and "white" really means "all other colors"? 28. "Worldwide Annual Coffee Consumption Per Capita". Eh. 30. 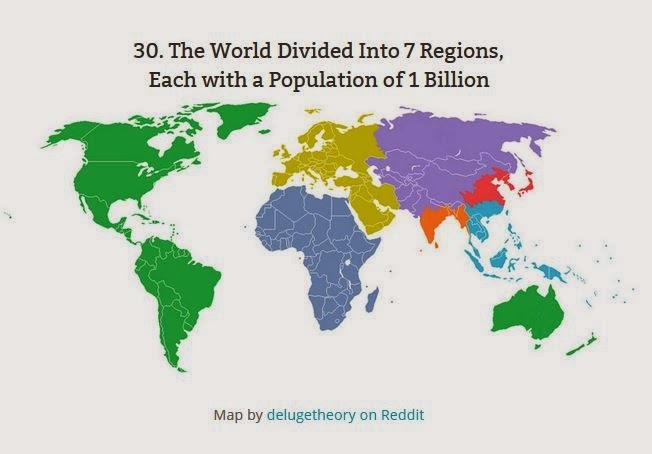 The World Divided Into 7 Regions, Each with a Population of 1 Billion: Whatever.